Forget about the few ancient examples and bizarre shepherd shelters. 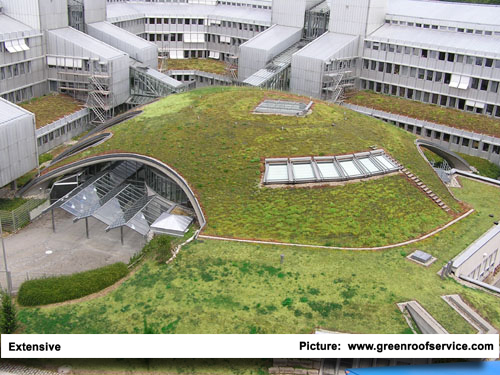 Modern green roof technology began in the early seventies in Germany when the first complete green roof systems where developed and marketed on a bigger scale. The first approach was to offer reliable technology providing sophisticated irrigation and reliable protection against root ingress for rooftop gardens. 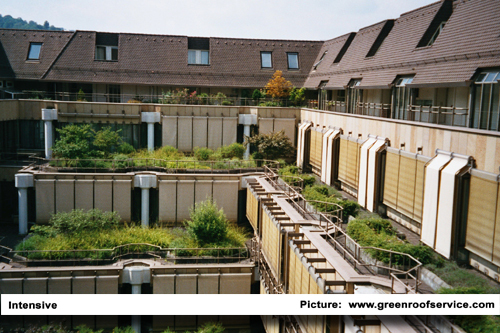 The second big step was the development of extensive green roofs in the late eighties. 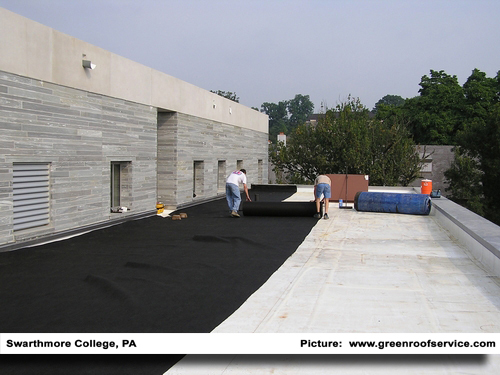 The goal was to create lighter and cheaper systems which could be applied to large flat roofs. 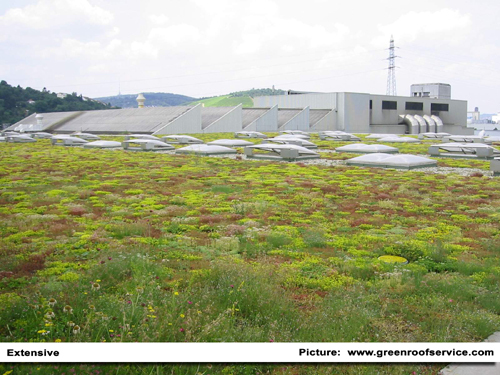 The main motivation for extensive green roofs has been recovery of nature and protection roof membranes from temperature changes and the elements. As extensive green roofs became object to scientific research additional benefits began to gain importance. 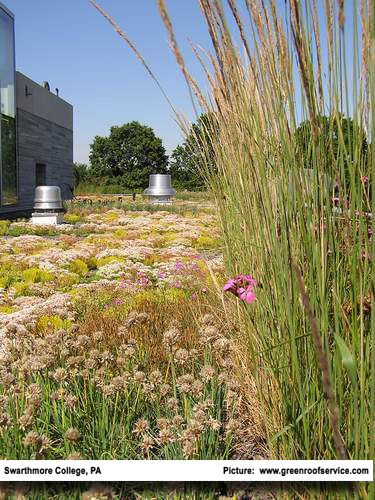 Today, ecological benefits like reduced energy consumption for heating and cooling, storm water retention and heat island mitigation are the main reasons for the growing popularity of green roofs. Typically 3-6 inches deep with a saturated weight of 15-30 lb/sq.ft. They are ideal for the growth of drought-tolerant plants, particular succulents like Sedum. They don’t need irrigation and only little maintenance. 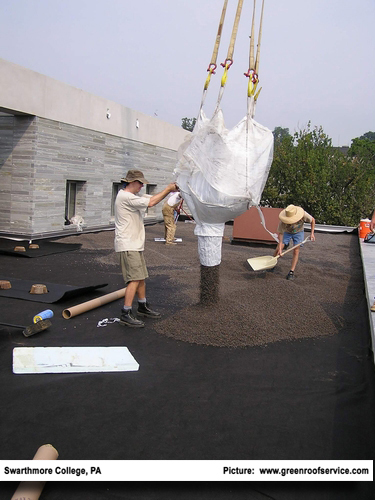 Due to the low maintenance, they are the roof of choice for building owners looking to reduce costs and improve the environment. Usually 6-12 inches deep with a saturated weight of 30-50 lb/sq.ft. Whether irrigation is necessary ore not depends on the regional climate and on the kind of plants that are used. 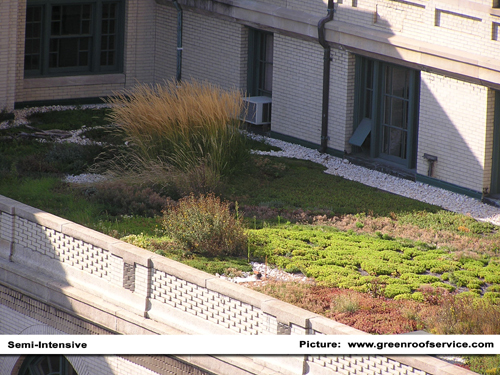 Shrubs, perennials, herbs and grasses can be used on semi-intensive roofs. 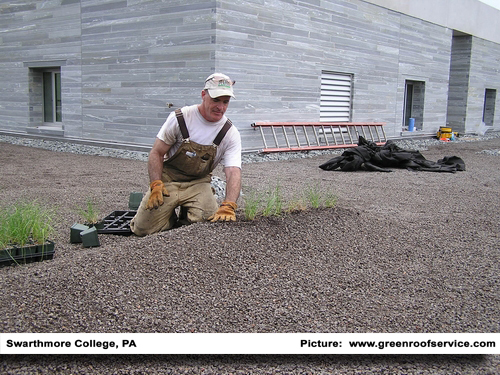 Maintenance is still quite labor intensive because the design of most semi-intensive greenroofs is still garden-like. For intensive greenroofs, the growing media is fairly deep – usually more than one 1 foot – and supports shrub and tree growth. A roof top garden or a patio is an example of an intensive roof. The saturated weight is 70 lb/sq.ft or more and irrigation is necessary in most cases. They also require a lot of maintenance, like any other well-kept garden does. While American Standard Testing Methods (ASTM) for green roofs are still missing, existing standards developed in Europe can be used as an alternative in order to avoid failures. The German Landscape Research, Development and Construction Society (FLL) is an independent non-profit organization. It was founded in 1975 by eight professional organizations. The FLL green roof working group is only one of 40 committees which have published a long list of guidelines and labor instructions. 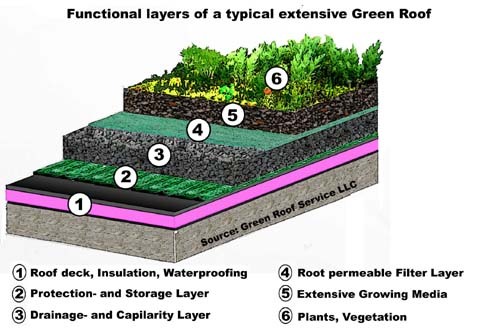 The FLL has been working on standards for green roof technology for 25 years. 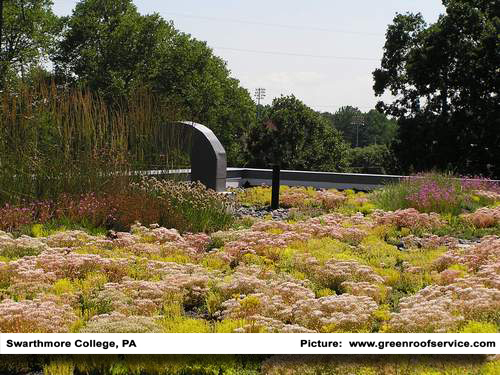 Their ‘Guideline for the Planning, Execution and Upkeep of Green-Roof Sites’ (FLL-guidelines) reflects the acknowledged state-of-the-art technology. Although the guidelines don’t give solutions for all green roof problems it is a basic tool for the construction of reliable and high quality green roofs not only Germany. The latest edition dating January 2002 has been released in an English version in 2004. From the legal standpoint this German guideline cannot substitute or stop future American standards, but they are a very good source of reliable information which is based on the experience of almost one billion square feet of green roofs built. Portions of this web page Copyright © Green Roof Services, LLC. Used with permission.